$50 Tour Fee for exclusive tour and education by experienced alpaca breeders. Learn all about alpacas and how we turn their fleece into luxurious products. This is an *exclusive* tour that will be led by alpaca breeders with years of experience. By the time you leave, we promise you’ll have a new appreciation for these magical animals, and possibly be ready to start your own alpaca adventure. We’re a busy farm and want to make sure we’re available when you visit. We also want to make sure you have our dedicated attention and the experience of a lifetime. Tours and classes by appointment only. $50 Tour Fee is for the group. Alpaca selfies are always free! Scheduled tours are currently available on weekends only. If you don’t see any time slots available, check the next weekend for availability. 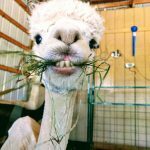 Listed as one of Clarkesville’s top Georgia alpaca farms to visit on TripAdvisor. Listed as a locally grown producer of alpaca products by Georgia Grown. Listed as a destination for alpaca farms to tour by the Georgia Agritourism Association. Help us spread the word! Tell others about your tour experience.